Un Used Stihl KM Kombi Drive Shaft Alignment Bush - Long Reach Hedge Cutter etc These are genuine Stihl Parts. 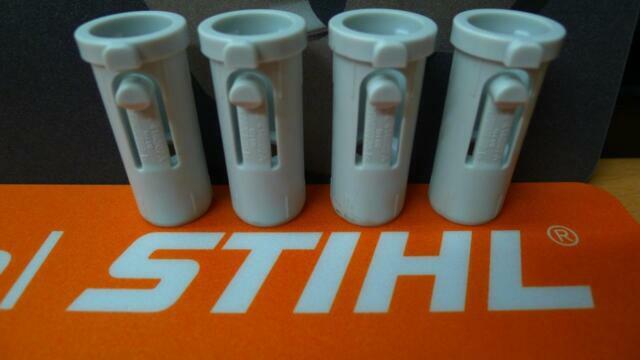 For the Stihl KM Combi syste, these are the bushes which sit at the end of the tool drive shaft and are designed to wear and be sacrificial (ie they wear rather than the metal drive shaft). Suitable to all KM tools including the Long Reach Hedge Cutter, Strimmer, Pole Saw, Blower, Edger etc etc. Offered as a group of 4 bushes. UK P&P is included in the 'Buy it Now' Price of £12.99.